This entry was posted on April 21, 2014 by wp_admin. We ship most items via the post office. Please note, we never tell anyone when a package will arrive. We can only say how long it takes most people to get a package. Over about 4 pounds ship Priority mail or Parcel Post. 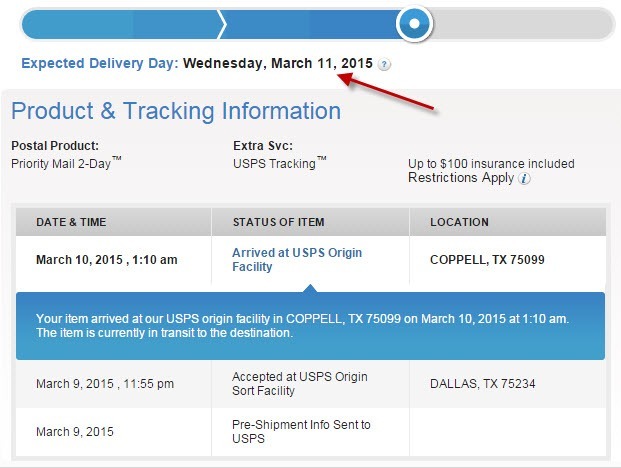 Once your tracking number is active, the Post Office will give an Expected Delivery Day - don't be fooled by it. It would be nice if the Post Office factored in current weather and the current logistics of getting a package from me to you. I can assure you they have not. This date has all the weight of a first grader saying "Sure, I will have that done by Wednesday". What they really mean is, if there is no weather issues, no mechanical issues, nobody goes on vacation, nobody gets sick, and nothing else happens, most people in your situation would get the package on Wednesday. Also, please note that the tracking information is not updated minute by minute. There may be no activity shown for 3-4 days, and suddenly the tracking information is updated with several events that happened during that time. The Post Office advertises Priority and First Class mail like they always arrive in 1-3 days, but our experience is different. In most cases (i.e. 51% of the time) they do arrive in 1-3 days. On the phone, when you call to ask where your package is, then they admit the services can take up to 7 days. One time, we saw 11 days. And on the phone, they don't have any information about your package not on the USPS tracking page. More than 7 days - about one of a thousand take more than seven days. The math majors will note it didn't add up to 100%. The numbers are based on our experience. I don't know the exact breakdown, and the breakdown probably changes due to weather. If your package has not arrived by the Expected Delivery Day, in general we don't know why. We don't have access to tracking information beyond using the USPS tracking page. A few people believe that if they put enough pressure on us, they will find there is something we could do, but just don't want to do. Please be respectful. The Post Office is like the Armed Forces. They do things their way, for reasons only they seem to understand, and don't explain anything to us. And just like the Armed Forces, we have no control over the the Post Office. But both branches of government generally get the job done. It is obnoxious for everyone, but the best course of action for the first week is to wait. 99.9% percent of the time, packages arrive in 7 days. Once a package exceeds 7 business days, and the tracking number does not show progress, then we re-print and reship. The most common non-decal related inquiry we get is why a package has exceeded the Expected Delivery Day, often combined with a request for a call back. Please understand that we do not call back to repeat the information available on this page. If you thought inside-the-USA shipping times were hard to predict, international shipping times are even harder to guess. Shipments to Canada can be four days, or two weeks. All international shipments go via USPS and exact details on how they ship and are tracked is on this page. Packages will then be delivered by your local post office. Some people wonder why we don't use Fedex or UPS for international shipments. We find that very few people want to spend $50-$80 on shipping charges when the postal system works, albeit a little slower. Some countries have import duties that may apply. We won't worn folks subject to them because we don't know the tax responsibilities of your specific country.